The No. 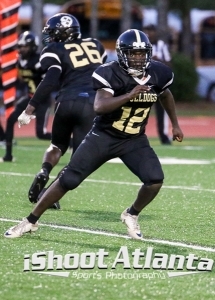 10 ranked Southwest DeKalb Panthers play host on senior night to the Lithonia Bulldogs with a spot atop the Region 5-5A standings at stake as the two DeKalb foes kickoff at 8:00 pm at Godfrey Stadium on Friday. Two-time defending champion Arabia Mountain (4-3), Southwest DeKalb (7-0) and Lithonia (5-2) are all knotted atop the standings with 2-0 marks heading into the week. Southwest DeKalb has climbed to a 7-0 record behind defense and a solid running game and timely passing plays. The 7-0 start is the best since a 10-0 run in 1999 and includes the program’s 500th victory (37-7 over Tri-Cities on Aug. 31) which made the Panthers the 37th program in the state of Georgia to reach the 500 win plateau. Southwest DeKalb joins DeKalb rival Tucker (544-272-14, 27th) as the only DeKalb teams to climb over 500 wins. Eian Scott leads the Panthers’ rushing attack with 76 carries for 518 yards and five touchdowns while senior running back/defensive back Jamel Starks has contributed 322 yards rushing on 35 carries and six touchdowns. Rion White has 732 yards passing and seven touchdowns with his main targets being Aquil Muhammad (149 yards, 3 TDs) and Bryant Ulmer (223 yards, 2 TDs). Senior linebacker Derico Smith (52 tackles, 2 sack, 5 TFL) and Starks (32 tackles, 9 TFL) along with defensive lineman Joshua Tate (14 sacks, 1 safety, 1 fumble recovery for TD) have been the stalwarts through the first six games for a defense with three shutouts on the season. The Panthers hustling defense allowed just 140 yards of total offense per game over the first seven games. Lithonia meets the Panthers for the 17th time and are looking to break a seven-game skid to the Panthers dating back to 2003. The last win against the Panthers was in 2002 (12-7). Lithonia is in its 70th season of football and stands at 344-371-11 overall and is looking for its first region title since 1984 while Southwest is going for its 17th overall and first since 2009. The Bulldogs are led by senior running back Shawn Morris (113 carries, 768 yards, 6 TDs) who is averaging 109.7 yards per game on the season. Quarterback Seoul Newton and senior wide receiver Kevah Brantley have connected 21 times for 440 yards and five touchdowns on the season. Lithonia’s defense has proven pretty tough this season allowing just 218 yards per game and 16.6 points per game. Sophomore linebacker Asmar Hassan has been the leader thus far with over 50 tackles and 5 tackles for a loss. In other Region 5-5A action co-leader Arabia Mountain travels to North DeKalb Stadium to take on Chamblee (0-7) at 8:00 pm and Columbia (1-6) and Miller Grove (1-6) go head-to-head at Hallford Stadium at 7:30 pm on Friday. Cedar Grove and Pace are playing for just the third time in the series with the Saints holding a 2-0 lead having won a Top 10 battle 49-0 in 2016 and 28-7 a year ago. The Saints are coming off a 30-3 win over then No. 5 ranked Westminster who scored the only points Cedar Grove has given up in its four Region 5-3A games this season. William Jenkins (4.5), Isaiah Ratcliff (2.5), Chris Samford (3.0) and Dante Walker (10.0) have combined for 20 tackles for a loss this season to lead the defense. Robert Jones has rushed for over 700 yards and seven touchdowns this season to lead the ground game for the Saints. Austin Smith has thrown for 800 yards and 15 touchdowns this year mainly to Jaden Haselwood (over 500 yard receiving, 6 TDs) and Rashad Jordan (over 300 yards receiving and 6 TDs). Pace is coming off a hard-fought 17-13 win over Lovett to improve its playoff status heading into the final weeks of the season. In other Region 5-3A action, Stone Mountain (1-6) goes for a second consecutive when as the Pirates host Towers (1-6) on Senior Night at Godfrey Stadium with kickoff set for 5:15. 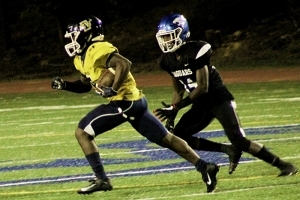 Redan (0-7) hosts Westminster (4-3) for a 7:30 pm contest at Avondale Stadium on Friday. No. 9 ranked Stephenson (6-1) travels to Southern Crescent Stadium to take on Charles Drew (2-6) at 7:30 pm on Friday. Tucker and Stephenson are both 5-0 and lead the Region 4-6A standings heading into this weekend. A pair of DeKalb teams go on the road to play early this week with games set for Thursday. Clarkston (0-8) heads to Clayton County’s Tara Stadium for a 7:00 pm tilt against Forest Park (1-6) while Druid Hills (2-5) travels to Eastside (7-0) in Region 4-4A action. McNair and Dunwoody play Saturday night games this weekend as part of the DeKalb County schedule. McNair (2-5) hosts BEST Academy (1-6) for homecoming at 6:30 pm on Saturday at Godfrey Stadium in Region 6-3A. Dunwoody (1-6) travels to Grady Stadium to face Region 7-6A foe North Atlanta (3-4) at 7:00 pm.